Square Enix has announced a new game for iOS and Android devices called Final Fantasy VII G-Bike. This game takes the mini game from Final Fantasy VII completely re-imagined with customize options, leveling and item collecting. In the original game from 1997 you have to play this mini game during the story line and you can play it later in the Gold Saucer. Final Fantasy VII G-Bike will be available for free with in-app purchases, however no release date has been given. Final Fantasy Type-0 HD announced for the West! A couple of days ago it was announced that the fan translation of Final Fantasy Type-0, under the name of Operation Doomtrain, has reached the final state and can now be played by everybody. Started by Sky back on 1 January 2013 it was a reaction to Square Enix's decision to not release it in the West due to market reasons. Today, Square Enix has announced that we will still receive an official version of Final Fantasy Type-0, but not on the PlayStation Portable. 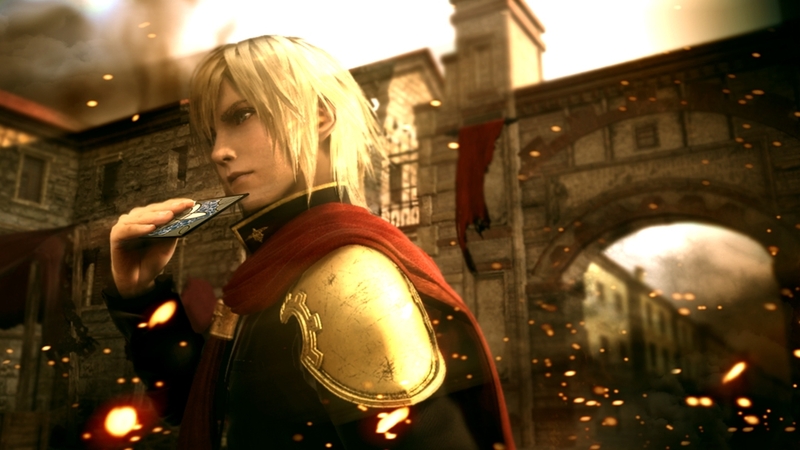 It will be remastered in HD on the PlayStation 4 and Xbox One as Final Fantasy Type-0 HD! I’d like to start this out by thanking everyone who let us know how badly you wanted this game to come to North America. Ever since the original PlayStation Portable release in Japan, you guys have never given up on it, raising your voices in an effort to see this title come to North America and Europe. Well, I’m here to tell you that it’s coming and it’s going to be in HD. Stay tuned for more details in the future. During a recent interview by Famitsu, Shinji Hashimoto, producer at Square Enix, said that they will release no new information of Final Fantasy XV and Kingdom Hearts III, which are currently in development for PlayStation 4 and Xbox One, at next week's E3 2014. Well, first I’d like to say that development for FFXV is going well. Internally, we try to ascertain the best timing for revealing new information about FFXV to the fans. So when we were going over our promotion plans, we judged that this year’s E3 would not be the best time to exhibit information about FFXV. Instead we are currently planning to exhibit new information at events after E3 2014. I am extremely grateful to all the fans who excitedly anticipate FFXV, and I’m looking forward to share new information when the timing is right. I would appreciate if fans hold out until then. We are are working diligently on KH3, but I think releasing new information will still take some time. We included a small part regarding the story of KH3 In the new trailer KH 2.5 prepared for E3 2014, so please check that out. Anyone surprised? It's dissapointing, but was kinda expected. Square Enix has released the E3 2014 trailer of Kingdom Hearts HD 2.5 ReMIX and has announced that this HD collection will be released on 2 December 2014 in North America and 5 December 2014 in Europe exclusively for PlayStation 3. Kingdom Hearts HD 2.5 ReMIX contains the HD remastered versions of Kingdom Hearts II: Final Mix and Kingdom Hearts: Birth by Sleep Final Mix and movie scenematics of Kingdom Hearts re:coded. The trailer also contains a teaser of Kingdom Hearts III, which is currently in development for PlayStation 4 and Xbox One.